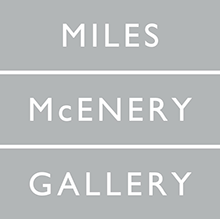 Artefuse, "Visual Stories: Franklin Evans and Robert Cottingham at Ameringer | McEnery | Yohe Gallery"
Everyone enjoys a good story, and when you visit the Ameringer McEnery Yohe Gallery in Chelsea, you can enjoy a wealth of interesting stories in the work currently on display. When I peeked in the window before entering, I knew I was in for a treat. The first thing I saw were these large canvasses filled with primary and neon colors arranged in interesting geometric shapes. Once I entered, I knew immediately this wouldn’t be an exhibit I could simply breeze through and get a general sense of. I spent as much time as possible with the paintings, practically eating up the rich story life in each. Franklin Evans’ work is the first you’ll encounter upon entering the gallery and can be seen from outside. He provides a very dramatic first impression of the show. What makes this artist’s storytelling so rich is that he includes snippets of various paintings in his pieces. Some are fragments of paintings that are well known, and some although not as familiar, integrate beautifully with the others. Where else will you see Matisse, Picasso and Titian all in one painting? In one of the works, Evans includes quotations by artists, my favorite of which is “a drawing should have the decisiveness of a good slap” – Henri Matisse. Matisse might have found Evans’ work to fit the bill. There is no ambiguity in his choice of color, composition or subject matter. Each painting has the effect of peering into many windows and the grid work he uses makes the viewer feel welcomed to not just peek in and observe, but step in and participate in the stories being told. The fun part for me was looking for the similarities in each small depiction and finding connections that pulled the whole piece together. The artist’s vibrant and surreal thought life is openly depicted and kept me thinking long after I left the gallery. Robert Cottingham’s work provides a very different visual experience, but is just as rich in story life. 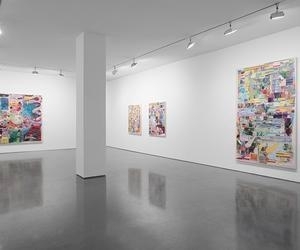 At first glance, I thought “O.K., very nice storefront signs”, but there is so much to experience when you take more than a moment to examine these beautiful and meticulously done paintings. The style of each sign, the building it’s attached to, the font chosen, and the colors, come together to create a vintage feel that I really enjoyed. Examining his paintings, including depictions of signs in front of a bar, jeweler, loan establishment and a theater, it’s easy to imagine who likely frequented these places. For instance, in the painting depicting a loan establishment, I could almost see the people who crawl out of the window near the sign onto the fire escape and watch people dressed in their Sunday best walk into the building hopeful for a loan. There are two large globes hanging from the loan sign seeming to remind the viewer of the reality of the weight that one might feel before finally receiving the support they need, and afterwards when they realize how much they have to pay back. In contrast, joy and celebration are depicted in the Empire Theatre sign which is affixed to a wall decorated with a print similar to the garb of a Court Jester. Memories of the excitement of an evening at a fantastic theater easily come to mind. I plan on going again before the show closes, and know that when I do, I’m sure I’ll discover so much more in the second viewing of each artists’ work. When you visit, give yourself some time to enjoy the stories being told, and bring some friends to discuss the treasures you’re sure to find. The show runs through October 7th. Bonus – the gallery is about two blocks from the Highline!